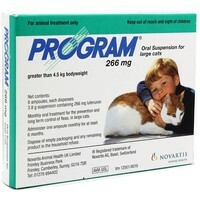 Program Suspension 266mg for Large Cats is for the prevention and lasting control of flea infestations in cats weighing over 4.5kg. Effective against the dominant flea species Ctenocephalides felis and C. canis, Program Suspension can be administered to all cats including pregnant and lactating queens. My cat has had terrible flea infestations on a few occasions. He is a short haired cat and trying to part such short fur to apply spot on treatments has proven to be a waste of time. Program is very easy to administer. Apply to his favourite food and he's none the wiser. Considerable decrease in fleas over the last few months with a few.still lurking around but the house was infested. Very happy. Excellent product to prevent fleas attack. Specially useful for cats that present skin reactions to the usual topical treaments. The product is also very sure, with no side effects. Highly recommended. I have two feral cats and as I'm on my own it's impossible to hold the cat,part the fur and use a spot on flea product. A friend mentioned flea suspension and we haven't had any problems at all. It's a white liquid so stands out against gravy or jelly, making it easy to stir in. One of my boys is very distrustful and I've fooled him 3 times now. I would highly recommend to any animal carer! I would highly recommend this product, particularly for animals who have any sort of skin problem and get stressed by anything that is applied to their skin (as my cat does!) I have always treated him with products applied to the neck area & although it is unlikely he is allergic to them, the very fact that something has been put on his skin causes a couple of days scratching/licking whilst he tries to get to the area. With this product it went in his food & absolutely no problem whatsoever - you know what they can be like, they very often seem to know that something has been put in their food and eat around it! It is obviously very palatable. Only the first month I have used it but fingers crossed! and it will be on my regular list from now on!